Shrigley Hall Hotel & Spa is an independently owned, luxurious Victorian country house hotel at the gateway to the Peak District. The Shrigley Hall Hotel & Spa is set in 262 acres of grounds on the edge of the Peak District National Park overlooking the Cheshire Plain. The hotel resort is well-known throughout the north-west of England for its 18-hole championship golf course and excellent leisure, spa (take a dip in the pool, work out in the gym or relax with a spa treatment! ), teambuilding and conference facilities. 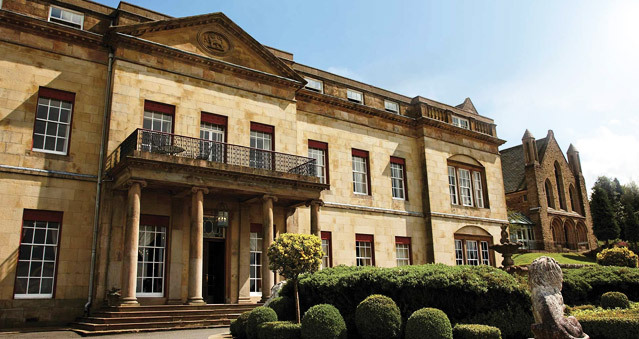 Shrigley Hall has free car parking and WiFi, 150 elegant bedrooms and an AA rosette restaurant. It is perfectly placed for outdoor teambuilding activities, as well as a shopping or cultural trip into the vibrant city of Manchester. Ideal for The Killing, Around the World, Awakening the Dead, Stocks in the City, Mixology, The Ultimate Team Build, Get in the Zone, Real Life Clu’Doo and many, many more. Location: Manchester airport is 12 miles away and Macclesfield train station is 7.5 miles away, close to motorway network.